SAKAIDE, KAGAWA PREF. 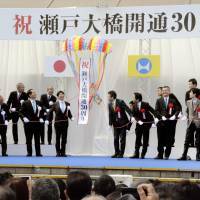 - A ceremony was held Sunday to celebrate Tuesday’s 30th anniversary of the Seto-Ohashi Bridges, a series of bridges connecting Kagawa and Okayama prefectures across the Seto Inland Sea. 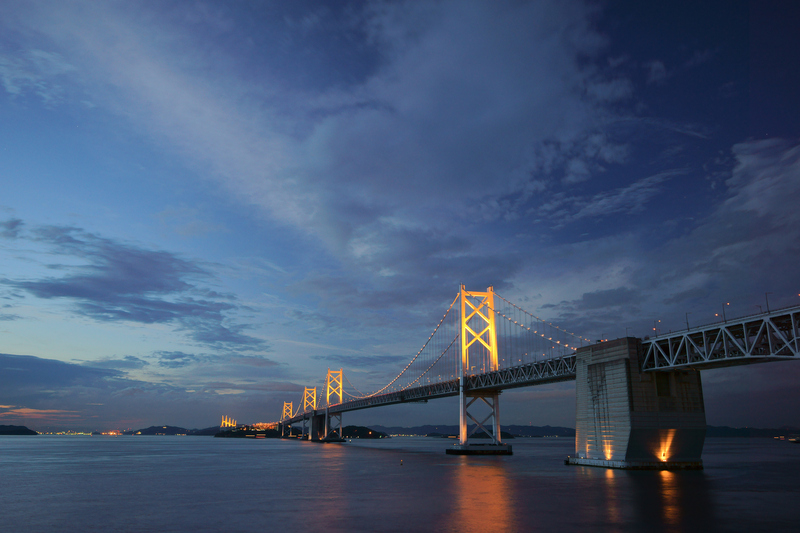 The Seto-Ohashi Bridges form one of the bridge routes linking the main islands of Honshu and Shikoku. 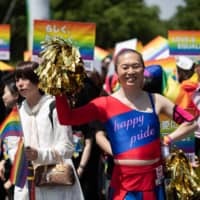 One of the other routes, the Akashi-Kaikyo Bridge, which connects Kobe and Awaji Island, Hyogo Prefecture, marked its 20th anniversary on Thursday. Sunday’s ceremony was held at the Yoshima parking area for the Seto-Ohashi Bridges in Sakaide, Kagawa Prefecture. 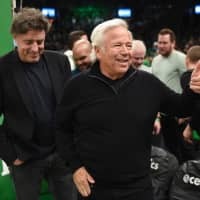 The event was attended by about 140 people. Kagawa Gov. 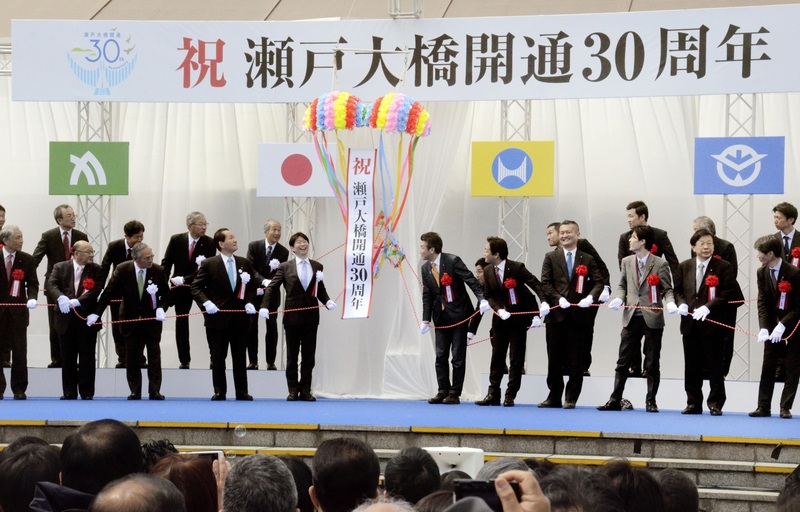 Keizo Hamada said he was delighted to mark the 30 years since the bridge route’s opening, which was a long-cherished wish of local communities. Okayama Gov. 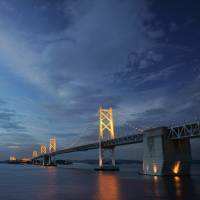 Ryuta Ibaragi said the bridges are in “wonderful harmony with the beautiful landscape of the Seto Inland Sea” and as such can play a big role as tourism resources. Of the three Honshu-Shikoku bridge routes, the Seto-Ohashi Bridges are the only link that accommodates both an expressway and a railway. 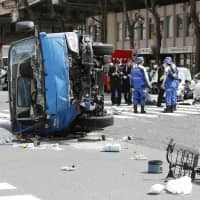 In fiscal 2017, which ended March 31, the number of vehicles that traveled on the Seto-Ohashi Bridges totaled just over 8.2 million, hitting a record high for the fourth straight year due chiefly to a reduction in tolls. Thanks to the bridge route, the number of visitors to Kagawa Prefecture surged to 9.37 million in 2016 from 4.9 million in 1988. The Akashi-Kaikyo Bridge boasts the heaviest traffic volume among the three Honshu-Shikoku bridge routes. It was used by 13.5 million vehicles in fiscal 2017. The improved access helped increase the number of people who make day trips to Awaji Island, which in turn led to a fall in the number of visitors who stay at least overnight on the island. The number of visitors who stayed overnight in fiscal 2016 was down about 8 percent from fiscal 1997. The local governments and communities on the island are working on ways to attract tourists for longer stays.